Albacete - located 173 miles southeast of Madrid. The settlement was originally named Al-Basit, "the plain," by the Moors. The city has been known as a center for the manufacture of fine daggers, scissors, and knives. Albacete is not known as a tourist destination, but its sights include the new cathedral and the Museo de Albacete. The Hotel Europa is located in Albacete, Spain, 200 metres away from the Cathedral, the Cuchilleria Museum, and the shopping district. Plaza Mayor is located 17 kilometres away. 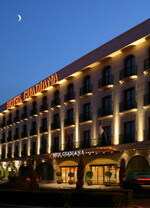 Hotel Europa has air conditioning throughout and the multilingual staff at the front desk are available 24 hours a day. The hotel offers concierge services and there is secure parking in the garage. Meals are served in the onsite restaurant and room service is offered during certain hours. There is a meeting room for small groups and wireless Internet is provided throughout the hotel.The 119 guestrooms are equipped with air conditioning, wireless Internet, and satellite television. 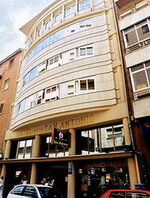 The Hotel San Antonio is located in Albacete, Spain. 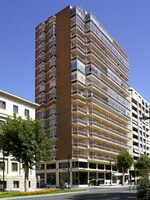 It is situated in the city centre, 100 metres from the commercial area and the Cuchilleria Museum. The Albacete Exhibition Centre is three kilometres from the hotel. Wireless Internet access is available in the air-conditioned public areas and multilingual staff are available to help from the 24-hour front desk. Hotel San Antonio offers room service during limited hours and meals are served in the restaurant. Evening drinks are available from the bar.There are 32 guestrooms, all with air conditioning and wireless Internet. The televisions have pay movies and satellite channels and there are direct-dial phones. Located on the plains of La Mancha, in a setting which offers the appropriate conditions for open-air activities, the Parador offers the traveller all the privileges necessary to enjoy a peaceful, relaxed stay. The garden and the swimming pool create an atmosphere which invites you to rest, to stroll or to have a refreshing dip on warm summer evenings. This La Mancha country house, with its attractive corridor, is characterized on the inside by an elegant simplicity, where the natural light acquires prominence. Large windows and immaculate wood combine with the luminosity of comfortable bedrooms. The 9 Hole Pitch & Putt Golf Course and Putting Green is open to the public. Pitch and Putt is like normal golf but with shorter distances between the holes. Take advantage of it during your stay, bring your golf clubs! 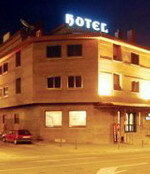 The Sercotel Los Llanos is located in the centre of Albacete, Spain, across the street from Abelardo Sanchez Park and 200 metres from the museum. 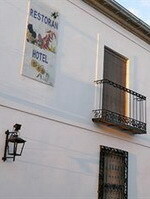 Distance to the train station is one kilometre and Albacete Los Llanos Airport is four kilometres away. Spread over five floors of a city-centre property, Sercotel Los Llanos is a modern hotel offering views of the city and neighbouring park. Amenities include a restaurant and bar, coffee shop, reading and social room, and lobby television. A buffet breakfast (surcharge) is offered each morning in La Taberna restaurant. Lunch and dinner menus feature traditional dishes from the La Mancha region.The 79 air-conditioned guestrooms have contemporary decor with wood floors and modern furniture. 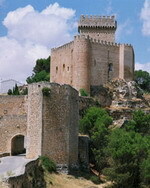 Almagro - the town was captured by the Order of Calatrava during the Reconquest, and hence the castle of Calatrava la Nueva was built to the south west of the town. The town consists of narrow cobblestone streets and whitewashed houses. Architecturally impressive, Almagro boasts its colonnaded stone Plaza Mayor, with distinctive enclosed, green balconies. 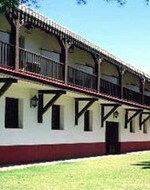 An inn set around two traditional courtyards, with exposed beams and galleries supported by wooden pillars. The inn conserves its old stone floors, Moorish tiling, waterproof floor tiles, masonry, wrought iron grilles and some original doors. It is, in short, a very typical Almagro building. One of those charming places where time stands still for enjoyable moments in a traditional atmosphere. The first of the courtyards has a fountain, pedestal tables and an olive tree. It lets bright sunlight into the lounge, reception, the restaurant's private room, the reading room and two of the bedrooms. The second courtyard has a pretty summer swimming pool, with loungers for you to relax and enjoy the sun. The interior decor is outstanding for its bright sunlight, simplicity and rustic touches, as well as tasteful use of colours that adds warmth and harmony - whites and ochres for walls and ceilings, along with stained ochre on woodwork. The Convent of San Francisco was built by the Dávila de la Cueva in 1596. It is located in an area of outstanding historic and artistic interest just 5 minutes from the main square. Here visitors have the opportunity to discover the prettiest corners of the town, including the ‘corral de comedias’ (open-air theatre) and the surrounding nature reserves. The interior decoration is finished with beautiful galleries, woodwork and lattices. The Parador’s restaurant provides traditional Manchegan cuisine with Arabic influences. 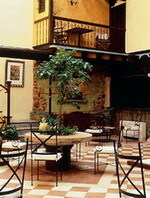 The rooms within the hotel are welcoming and have a stylish feel, featuring 14 interior courtyards and a swimming pool. The bedrooms are found in the former monastic cells, providing peace and serenity. The house dates back to the 18th century and preserves all the flavour of an old house combined with many touches of colour. The covered central patio, with several fountains, serves as a hallway to the bedrooms, from the sound of the running water can be heard. The breakfasts are generous in helpings and quality. The hotel also has a small wine cellar. The El Corregidor restaurant. Traditional La Mancha dishes and also some modern dishes. The bedrooms and bathrooms have been designed and decorated with great care by the owners, who have studied every last detail and ensuring all the rooms have a feeling of spaciousness. To this effect, all the bedrooms have a small lounge area, large beds, a wood fire in two of the rooms, pressure showers, mini-bar, etc. The daring use of colours and the work carried out by local artists and cabinet makers is eye-catching. Ciudad Real - capital of the province of Ciudad Real. The capital was founded by King Alfonso X in the 13th century to fight against the power of the military order of Calatrava. It has a stop on the AVE high-speed rail line and has begun to grow as a long-distance commuter suburb of Madrid. 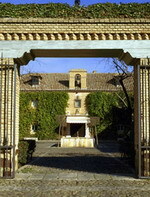 The BH Almanzor Is located in Ciudad Real, Spain, 23 kilometres from the Corral de Comedias, and 82 kilometres from the Cimbarra Waterfall. 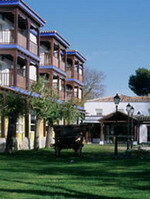 BH Almanzor has a restaurant on site, which serves modern Spanish cuisine. Room service and breakfast are available for a fee. The hotel has a conference room, and space for small meetings. This hotel has a safe-deposit box at its 24-hour front desk, where concierge services can be found. Guestrooms at the hotel all have satellite television, as well as complimentary toiletries and complimentary daily newspapers. Located in a La Mancha style country house in Manzanares, the Parador De Manzanares is placed between three most beautiful nature reserves of the country, which are Cabaneros, the Ruidera Lagoons and the Tablas De Daimiel. Trees, bushes, gardens, and plants impregnate this place with greenery, and with its swimming pool make for a very appetising setting within the La Mancha countryside. The hotel has well-appointed rooms that are equipped with modern amenities, provides an affable and friendly atmosphere. You can dine at the onsite restaurant, which serves regional specialities and also enjoy a fine drink at the bar. Conference facilities are available for people on business travel. During leisure, you can relax at the pool or explore the city. The Hotel Guadiana is located in Ciudad Real, Spain, 100 metres from the Don Quixote Museum, and 200 metres from both the historic and commercial centres. There is an outdoor swimming pool on site and a sauna is available inside the building. Wireless internet access is available in all public areas. The hotel also provides babysitting/childcare services. Decorated in scarlet and butterscotch tones with a wooden central pillar doubling up as a drinks' cabinet, Hotel Guadiana's Restaurant El Rincon De Cervantes serves a range of international dishes. The 102 air-conditioned guestrooms are decorated in butterscotch tones. Cream-coloured bedding with scarlet pillows in silken fabrics is complimented by dark wooden furnishings and fireplaces. 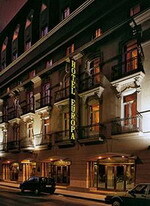 The Hotel Alfonso X is housed in a 19th century building which retains its period red-brick facade with distinctive wrought-iron railings at each window. It is located next to the shops on Plaza Mayor and the City Hall. The restaurant serves international food and regional La Mancha dishes from a la carte and set menus. There is also a café onsite, where guests can relax with a drink. The hotel's public areas mix traditional fabrics and floral decoration with contemporary wood and metallic surfaces, and wireless Internet access is available throughout. The 66 guestrooms feature modern decor and marble bathrooms; all include satellite television, safes and minibars.